A taste sensation is coming to Troon Old Parish Church! 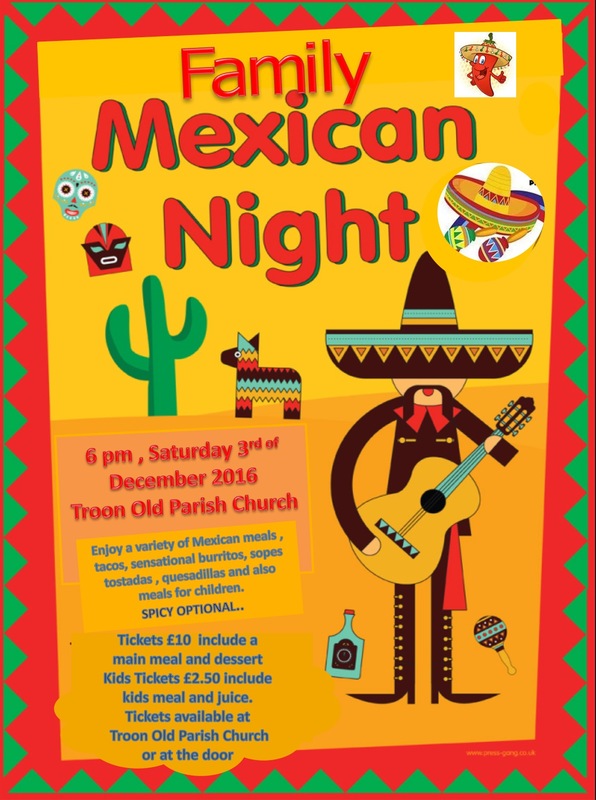 Our friend Lorena Mendez, who runs Troon Spanish Group in our church halls every Monday and Friday, is putting together a Family Mexican Night on Saturday 3rd December from 6 pm. Forget about dreich winter for a night as you savour the flavour of sunshine – tacos, burritos, sopes tostadas, quesadillas, as well as meals for children. We are told that “Spicy is Optional” so there should be something for you however adventurous you are feeling! Tickets cost £10 and include a main meal and dessert. Kids’ tickets at £2.50 include a kid’s meal and juice. Tickets are available from the Church Office or at the door on the night.